Many things have happened since my last posts. 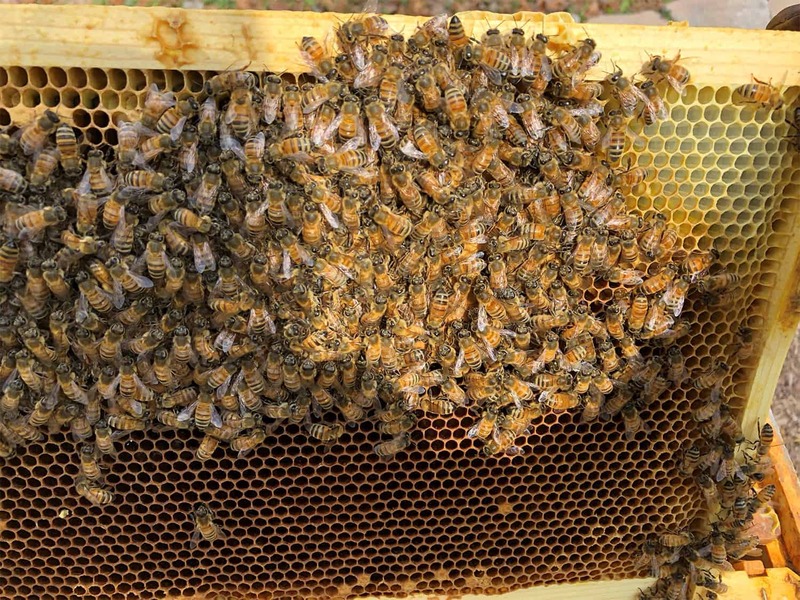 You are due lots of updates about what’s happened over the winter months in Beorn’s Apiary. Winter seemed to last forever and we are still having off-and-on cold snaps here in western North Carolina. During December, the apiary was visited with a pretty significant snowstorm. And, for the first time in a couple of years, we had significantly cold weather for an extended period of time with some of the coldest temperatures in a couple of years. Through all of that, I fretted over how my bees were performing. So, let’s get to the updates. You may remember that after the Apivar treatment was completed on my hives, my next to last inspection in the fall discovered deformed wing bees in Hive Olympus. I was devastated to see it as it could mean only one thing – the dreaded Varroa Mites had beaten my treatment regimen. 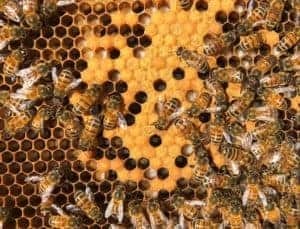 Sure enough, examining the bees in that colony, I found a fair number of bees with this condition and the colony (which had been super strong) was on a rapid decline. At that point, it was too cold for any of the natural treatments like Miteaway or Formic Pro, so I knew my only option was to vaporize Oxalic Acid in the hives. Sometime in November, Hive Olympus became a complete deadout. I knew if that colony collapsed that the other three colonies had to be experiencing mite infestations. 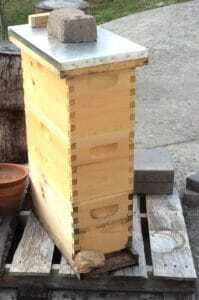 My first plans were to treat the hives in early December but the weather warmed up and the bees broke winter cluster. So, I ended up having to wait until the first week in January when I could get my hands on a vaporizer. I purchased a vaporizer at our local bee shop. During January, I performed three treatments (one each week) on Hives Rome, Florence, and Acquitaine. The first treatment was exceptionally revealing. Two days after treating, I pulled the IPM Bottom Boards to see what the first treatments had accomplished. Hive Florence’s IPM board looked like a mauve mass of dead Varroa Mite carcases. They were actually piled up atop each other. That had me fearing that I would lose this colony as well. Better news came from Hive Acquitaine. Although there were a significant number of dead Varroa Mites, this colony was not showing the signs of rampant infestation like Hive Florence. I have sense noticed that there is hygienic behavior from the bees in this colony (more on that later!). I didn’t have a bottom board in Hive Rome (my nucleus colony) but I had reason to believe that the treatment was as effective for this colony as the others. After three weeks of treatments, I knew that all I could do was wait for spring and the first inspection. The good news was that on warm days when the bees broke cluster I saw plenty of departing bees from all three colonies but it was clear that Hive Florence had really taken a beating. By late February, we were experiencing unseasonably warm weather with crocuses waking up and daffodils sprouting. By the first week of March, even more tender perennials were beginning to sprout. For those who still dismiss climate change as a myth, I have to say the evidence is clear in western North Carolina. Beekeepers throughout western North Carolina are having to change old patterns that have always worked for beekeeping due to warmer winters in which the bees never completely remain in winter cluster for an extended season of “rest”. 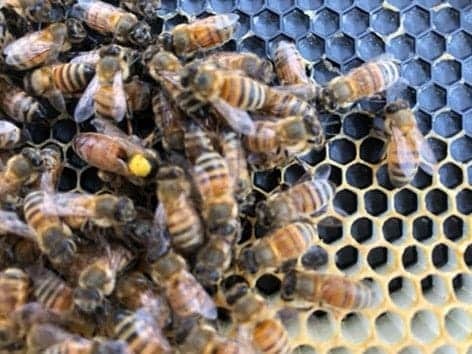 This means going into winter with more honey so that the bees do not starve, being ready with fondant or winter patties in case they run out of food stores, and watching out for the early emergence of significant brood which can lead in this area to early swarms – never good if you don’t have drones to breed virgin queens! Hive Acquitaine has a strong cluster of bees. Just how strong? 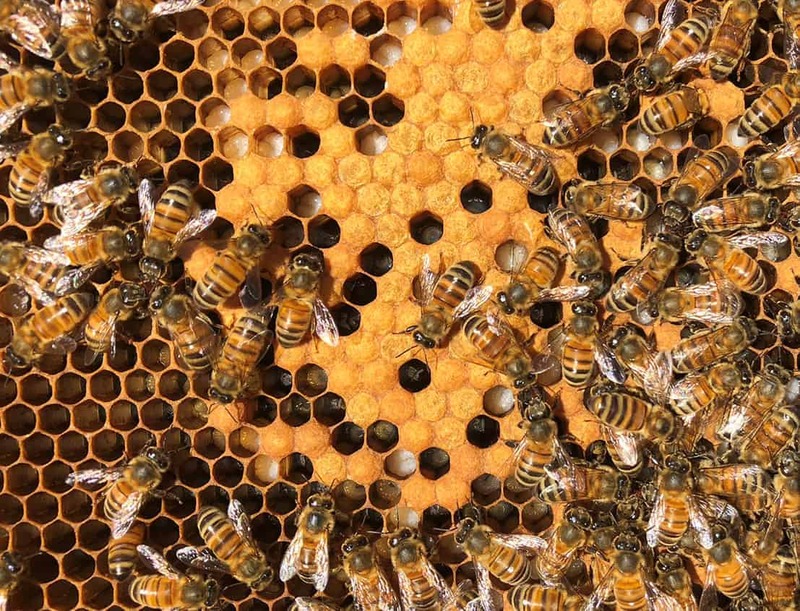 Five frames of solid brood pattern and masses of bees! 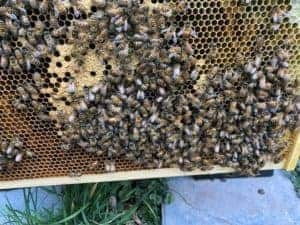 In early March, we had our first days above 60 degree temperatures and I decided to perform my first inspection to determine where my food stores stood and what colony populations looked like in my apiary. For the most part, my inspection revealed pretty good news. Hive Acquitaine was incredibly strong. I found Eleanor wondering around five frames of near wall-to-wall brood. 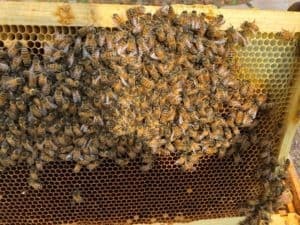 I was one thrilled beekeeper when I saw this! I was even more thrilled when I looked at the population in the hive. Not only was it strong, it was flourishing! 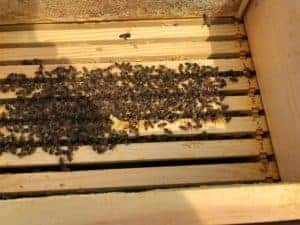 I did find that most of the honey stores in the lower brood box had been depleted and the colony had moved up into the second brood box where Eleanor was busy at work. The medium box still contained almost completely intact honey stores. I reduced down to one brood box and the medium box to consolidate the colony and keep it close to the full honey stores. Hive Florence was a totally different story. 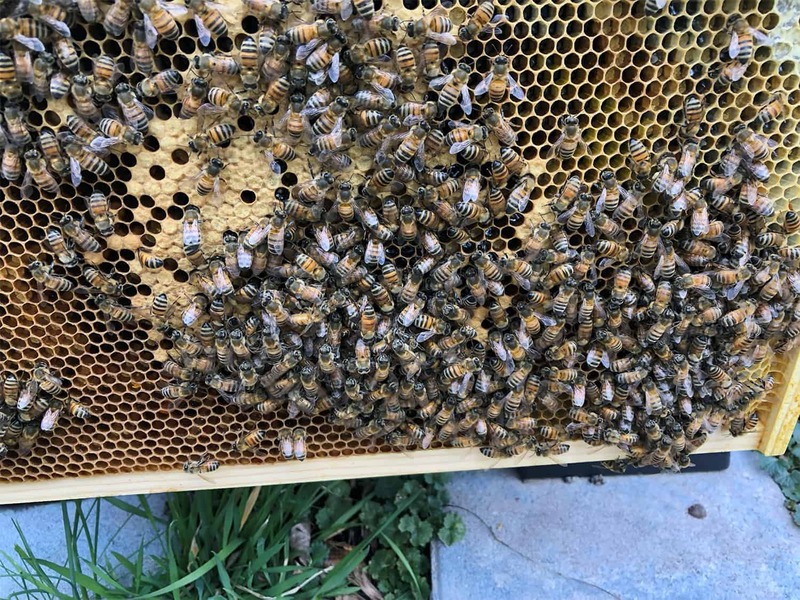 I knew that the amount of Varroa Mites I discovered after my first oxalic acid treatment meant that these bees had gotten beaten up pretty badly. I found the cluster in between the lower and upper brood boxes and they were warming a small cluster of brood. 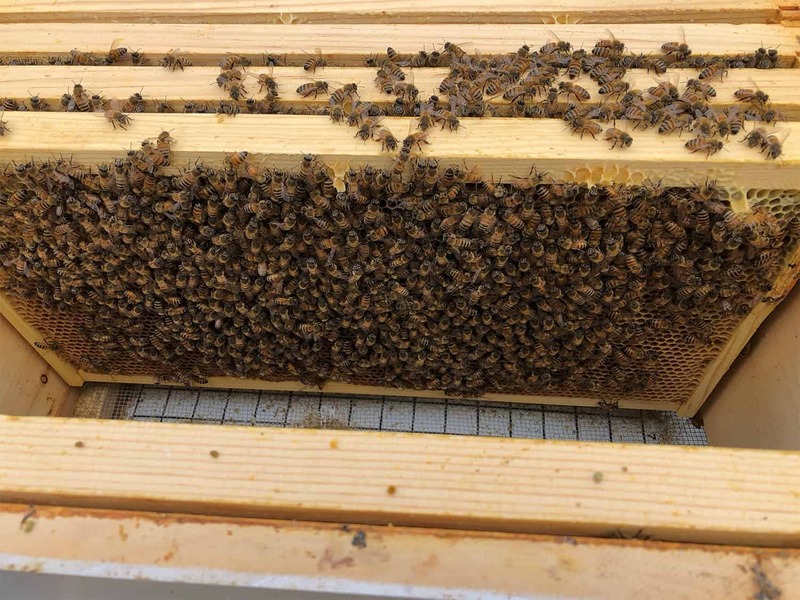 The cluster was way too small for comfort and so I took a frame of brood and nurse bees from the burgeoning Hive Acquitaine and united them with this colony. 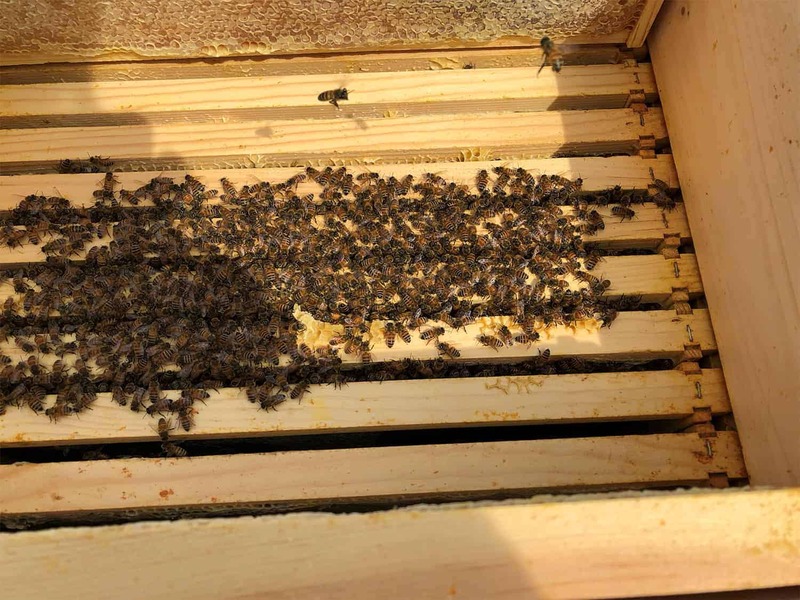 I also reduced down to one brood box and the medium box also still quite full of honey. 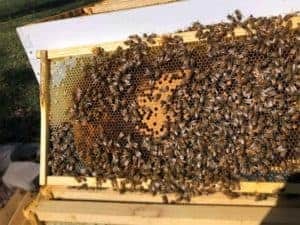 That addition of brood did indeed jump start the colony as most of it was capped brood and the colony already has a significantly larger amount of traffic coming and going from it. A solid brood pattern before Spring. Turning my attention to Hive Rome, I wondered what the nucleus colony would reveal. This little colony also exceeded my expectations. It had a solid small cluster at the start of fall. That cluster weathered the cold temperatures and Varroa Mites. I notice that on warm days the population seemed to be heavier than I expected. During my first inspection, I found a small but solid brood pattern in between the lower and upper brood boxes. And it appeared that they had been raising brood for a while. The small winter cluster had grown into a solidly sized cluster actively foraging for pollen. This small colony seemed to have fared just as well as Hive Acquitaine during my Varroa Mite infestation. Honey stores remain in this colony but they are on the light side. Hive Rome becomes a Nucleus Condo for a while. So, with the colonies beginning to show clear signs that they are about to go into a full spring population explosion (even the weakest one is showing signs of solid growth now), it is time to start feeding, especially since I want to do a couple of splits this spring from my colonies. So, I have now placed two bottles of sugar syrup inside a hive body in each of the colonies. Hive Acquitaine has already begun taking the sugar syrup in small quantities and now that the other two colonies have risen into the medium box filled with honey I believe I am days away from large intake of sugar syrup. 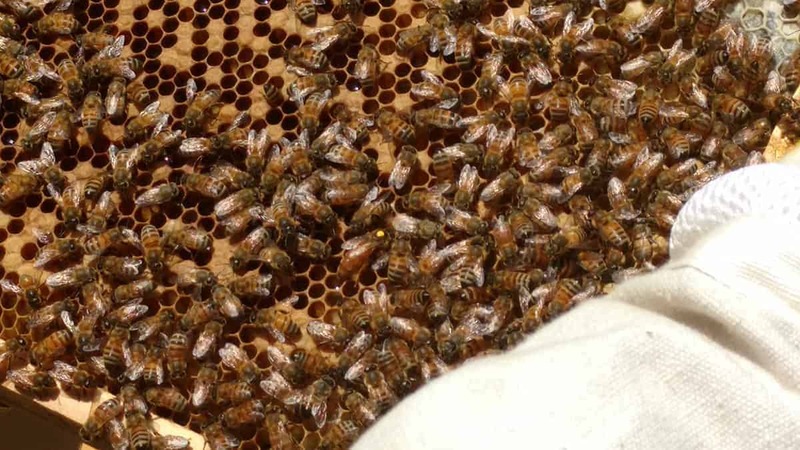 When the colonies start ingesting this ready supply of food and energy, I should start to see more solid and rapid growth in the development of brood and hive populations. I hope to be able to ramp up to the full top hive feeders by early April as the temperatures in the evenings continue to stay in the lower 40s and not in the 30s. Although my loss of one colony in the winter term, severely dampened my grand plan for this spring it didn’t really put a stop to it. 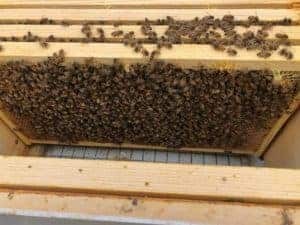 It just means that honey production will not be as strong this spring as it would have been had I had three full production hives by the time of the honey flow. But, I have one definite survivor colony with a queen with some obviously good DNA. 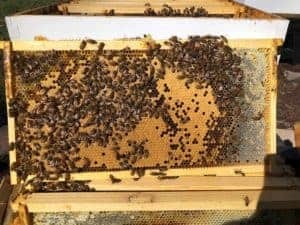 I will attempt to raise queens from Eleanor while raising nuc colonies from all of my colonies. Other topics as they may arise. I hope to start with some in depth information about the Buckfast bees early on for you. And, if I get lucky enough to successfully obtain the two Russian queens (I’m on the waiting list), I’ll certainly be talking about my experience with Russian queens.